Hello, I am Courtney Strong, a food artisan specializing in smaller scales. 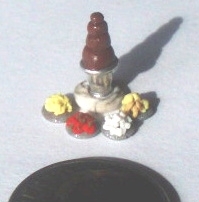 Miniatures have been a part of my life since I was four years old, when my grandmother built me my first dollhouse. Over many years we had a wonderful time together furnishing and accessorizing. My passion returned as an adult and as I was putting together a new house with my childhood items, it occurred to me that I could make my own cakes. I decorated cakes professionally for almost ten years, which provided me then and now, with much inspiration. 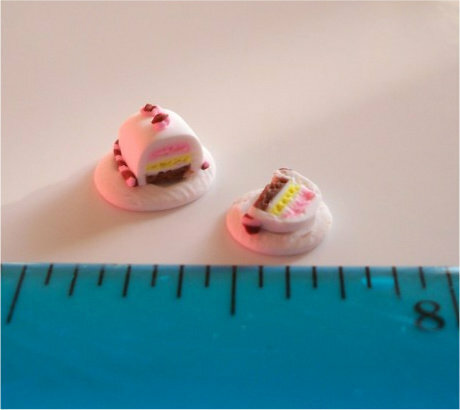 Creating my cakes, I soon discovered the online world of miniatures, which has brought a great amount of joy to my life every day. I didn't think it could get much better... then I decided to try going smaller than the average miniature. I ventured into the smaller scales, where I have really stayed. My favourite scale to work in is 1:48. I enjoy the challenge of achieving as much realism as possible into my micro creations, be it cakes, desserts or savoury items. I do work in all scales 1:12, 1:24, 1:48 and 1:144. Recently, I received the great news that a tutorial of mine has been published in the July 2010 issue of Dollshouse World Magazine. Enhorabuena por la publicación. Verdaderamente las tartas te quedan geniales.